i was feeling down tonight and this gave me a good laugh. your mom and my mom shop at the same stationary store. ;) i had a note on funeral parlor stationary about a year ago, "Remember protect your body against the man until marry. Praise Jesus name." your blog is the first korean themed blog I've read that speaks to me. Keep up the good work. I've knows this for a fact, but really conclude now that all korean mothers finish their notes/cards with "ah men and/or god bless you and/or pray"
Um, did you dig this out of my trash? My dad wrote me a similar note recently, about my student loans. Blegh. I wish we could get your mom and my grandma together. And tape record the dialogue for when we need perspective. i really wish there was some way to post the other notes, what a great art project it could be. and soon-ok, funeral parlor stationary may be the best yet - I mean, where could she have gotten that?? 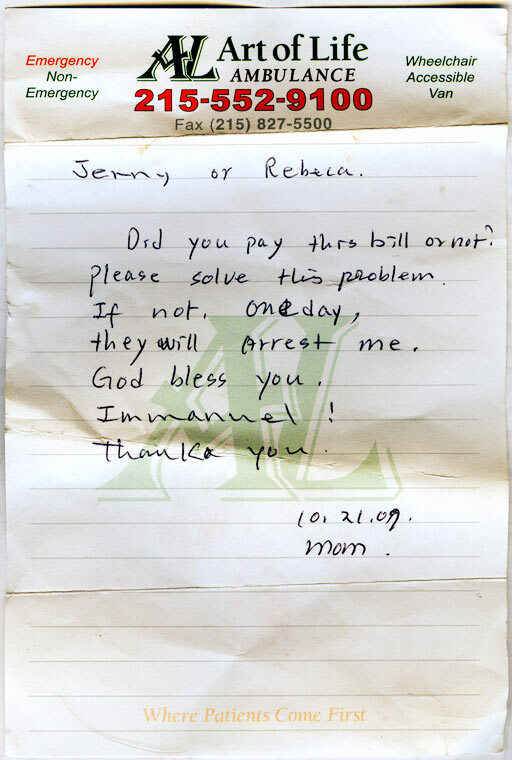 until i had two kids and mom started calling my sister instead, i used to dread her phone calls becaus half would inevitably start with, "jenny, i need letter..." and then I'd have to sort out a complicated mess that she really was responsible for but i'd have to somehow get her off the hook. find good man who LOVES Jesus and you will be happy girl always. respect Father, Mother, Brother. We are happy family! marry nice Korean church boy and we will be so happy, marry jewish and we will be SO SAD!! "jewish" as he is always referred to is still my boyfriend. luckily his family is equally crazy so he understands. They have also tried to bribe me. "Marry nice Korean boy and we will pay for apartment, car, credit cards, everything. Marry jewish and you will get nothing and be so sad." okay, nicole's comment made me lol - when my days are humdrum or crazy like today w/ #2 being sick and #1 being needy, reading these comments save my mind. THANK YOU! My mom sends me messages that say things like, "I think you don't pray today. Pray daughter because you will be sad in Hell. So sad and terrible. Your sister prays every day. Be more like your sister."